Exercising and listening to music go hand in hand. It feels incomplete to pump away at the gym without beats pumping away in your ears. You pay a lot of attention to your workout gear, so pay as much attention to exercise headphones. Yes, it matters. From how they fit in your ears to the tangle of their cords, no pair of headphones is exactly like another. You need to buy the headphones that are right for you, not blindly go for the “most acclaimed” or “best rated” pair. Earphones only! Headphones add too much weight and don’t fit as snugly when exercising. Wireless is better than wired for exercise since it gives you more freedom. Wired earphones are cheaper, so it makes sense to go wired when on a budget. There are other considerations based on the level of activity involved, but these are the important prerequisites in our book. The cheapest “good” sports earphones money can buy. Not ideal for: Swimming, Running, Cycling. When you’re on a tight budget, you walk a minefield of rubbish earphones. Sure, the advertising doesn’t reflect poor quality, but they’re rubbish. The Koss FitClips is the exception. And we can confidently say that because of The Wirecutter’s thorough test. At approximately $15 and going as low as $12, you aren’t going to get anything better. The sound quality is decent, about what you’d expect from this price range. But these are also sweat-resistant, which is a major plus point for sports headphones. The cheapest “good” Bluetooth sports earphones. For a good pair of budget Bluetooth headphones, you need something with enough battery life to last a marathon run, sweat resistance, and a comfortable fit. The CB3 Fit Sport meets all those requirements without costing much. The sound quality isn’t brilliant, but it’s good enough for most songs, especially the kind of music you need in the perfect workout playlist Science Says This Is How You Make a Perfect Workout Playlist Science Says This Is How You Make a Perfect Workout Playlist The number of beats in a song can change how you feel. Now, use a neat software to make your own workout playlists with the right kind of songs and pump up your exercise sessions. Read More . Most important, the CB3 Fit Sport sits tight on your ear and won’t budge even at a full sprint. Throw in seven hours of battery life, and what more can you ask for at $40? 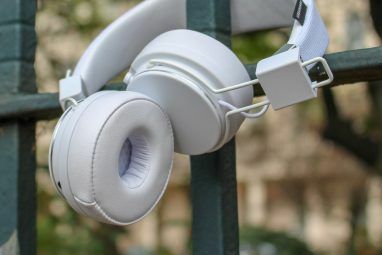 The best open-ear or unsealed headphones. Ideal for: Gym, Running, Cycling. Plantronics its flimsy wire with a more robust band to stop your headphones from breaking This Is Why Your Headphones Keep Breaking This Is Why Your Headphones Keep Breaking How long do your headphones last? Weeks? Months? Years? If they're breaking way to quickly, check out this list of exactly how to prolong their lifespan, and save yourself some money, too! Read More . The winning result is the Backbeat Fit. The BackBeat Fit first released in 2014. At that time, every review had the same line: if it cost around $100, it would be perfect. Well, it costs $75 now. It’s the kind of headphones that wraps around your ears so that it stays in place. That’s not everyone’s cup of tea (including mine), but the Plantronics Backbeat Fit makes it work somehow. It feels comfortable because the band isn’t heavy and it doesn’t tug on your ear. Multiple reviewers said they found it comfortable to wear along with sunglasses. Possibly the best running headphones. The Jaybird X2 surprised me. It’s an expensive set of simple earphones, but there is so much that Jaybird has got right for exercise that justifies its price. For $100, the white X2 is a steal. Right off the bat, you should know one thing: it takes getting used to. The X2 includes a wing-like rubber tip that fits into the groove of your ear, holding it in place. It’s difficult to like the first time, but after trying it for a few days you’ll realize what a magnificent job it does of keeping the earphones secure. You’ll get over the discomfort soon enough. Apart from that, the Jaybird X2 does everything right to make it one of the best Bluetooth headphones of this year The 7 Best Bluetooth Headphones You Can Buy The 7 Best Bluetooth Headphones You Can Buy Finding the right pair of Bluetooth headphones isn't easy, so we've compiled a list of the best Bluetooth headphones money can buy. Read More . It’s incredibly lightweight, the sound quality is fantastic, and the battery lasts for seven hours easily. Most important, you can get an hour of playback by charging it for 15 minutes — which is just what you need when you’ve forgotten to charge your headphones before a run. A waterproof iPod Shuffle with waterproof earphones. Not ideal for: Gym, Running, Cycling. Bad news swimmers. You can’t dive into the pool with a smartphone. So what do you do? AudioFlood offers a neat solution. They made a waterproof iPod Shuffle, along with waterproof earphones. The iPod Shuffle’s small size and light weight make it easy to pin on the back of your swimming goggles. The earphone wires can then be tucked neatly into your ears, pinned by the straps of the goggles. That way, they won’t interfere with your swimming, and you can listen to your music in peace. Apple hasn’t updated the iPod Shuffle in a long time, so you’ll need one of the old 30-pin connectors for this. 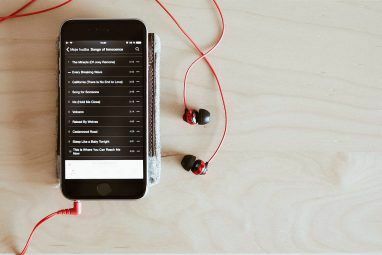 And of course, you don’t get all the goodness of Apple Music 10 Essential Apple Music Tips You Really Need to Know 10 Essential Apple Music Tips You Really Need to Know Since its launch in 2015, Apple Music has come a long way, baby. Unfortunately, it's still not the easiest or most intuitive service to get to grips with. Which is where we come in... Read More . But hey, 2 GB of memory is enough for an hour or more of songs. The best sports headphones right now. 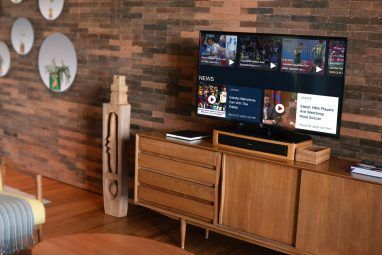 Bose garners the same following among audiophiles that Apple has in consumer tech, or Sharp has with televisions. We wouldn’t be doing this list justice if we didn’t include one of their offerings. Thankfully, it’s arguably the best one right now. Bose’s new SoundSport Wireless Bluetooth headphones receive praise for their sound quality, long battery life, perfect fit, and resilient nature. The box also includes a USB charging case to power up your headphones while on the go. Like the Jaybird X2, a 15-minute charge will give you an hour’s worth of playback. The Bose SoundSport Wireless is also among the few sports earphones to be praised for its hands-free voice calling abilities. Microphones don’t get much attention in exercise headphones, but Bose did a stellar job here. The dream of truly wireless earphones becomes reality. Ideal for: Gym, Running, Cycling, Swimming. Before Apple killed the 3.5mm headphone jack on iPhones No Stereo Jack, No Problem: Why the iPhone 7 Sounds Great No Stereo Jack, No Problem: Why the iPhone 7 Sounds Great It's official -- Apple has removed the standard 3.5mm headphone jack on the iPhone 7. But don't worry, this is a good thing. Read More and introduced the wireless AirPods, Bragi already had the Dash. There’s no wire connecting the right earphone pieces here. They’re truly wireless headphones. The Bragi Dash can be used to connect via Bluetooth to any music player, or you can use the built-in 4 GB of memory to load it up with songs. The Dash is waterproof, sweatproof and fits snugly in the ear. Of course, you can take calls too. Right now, though, the Dash hasn’t received great reviews. Almost everyone agrees that it’s like a piece of future tech, but it fails at some of the basics. For example, the Bluetooth connection drops often, the gesture-based controls are difficult to use, and the voice calling is downright unusable. Still, for the coolness factor, it can’t be beaten. Which Exercise Headphones Do You Use? All right, readers, you’ve now seen our choices, let’s turn the microphone over to you. Which earphones do you use when you’re at the gym, going for a run, or swimming? What has been your experience with them? Let’s chat in the comments. Explore more about: Headphones, Sports, Wearable Technology. I use the Backbeat Fit since a few months. The battery life is also 8 hours of use and it has controls to adjust volume, pause/play/next, microphone for hands free calling/voice control. Also, it comes with a sturdy armband to carry your phone... though it has no see through section on it. How about a recommendation for those of us who hate both our ears plugged while working out?